Every time I visit the Angouleme Comics Festival I’m a little bit jealous of the French and their never ending appreciation for comics. In France, comics are valued as an art form. They even call it the “Ninth Art”. Worldwide, the France boasts the biggest comics market after the US and Japan. This all becomes very clear if you visit Angouleme. What’s great about the festival is that it covers the entire spectrum of comics, from the obscure and experimental up to the latest bestseller by Robert Kirkman. These are my Top 5 Best Moments from the Angouleme Comics Festival. In January, the Angoulême Comics Festival puts up huge tents in the town’s squares to house the largest comic book market in the world. What never ceases to amaze me, especially when you visit on Saturdays and Sundays, are the long queues in front of “Le Nouveau Monde”. This is the largest exhibitor’s tent where some 75 indie and small press publishers present their books. It’s astounding to see men, women and children of all ages lining up to find out what’s new and happening in the world of indie comics. How cool is that? The sheer volume of indie publishers, artists and graphic novels you will discover at Le Nouveau Monde is overwhelming, and this alone is worth a trip to the festival. If I’d have to pick one thing not to miss at the FIBD, this is it. The announcement of the nominees for the “Palmare Officiel,” Angoulême’s Award for the Best Book, was overshadowed by an unfortunate scandal this year. The selection committee had failed to nominate any female authors and it backfired. I won’t repeat the story here, as much has been said and written about it. Nevertheless, the winner of 2016 really deserves the accolades. 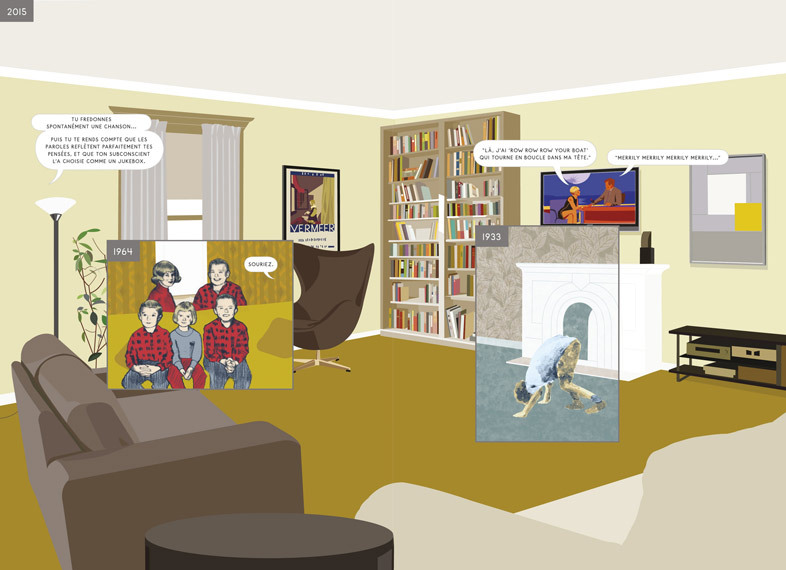 “Here” by Richard McGuire (US, 1957) is nothing short of a masterpiece. This amazing book tells the story of a single room in a house throughout time. The point of view is always the same. McGuire’s use of panels within panels to juxtapose fragments of the past, the present, and the future of the same space is revelatory. He uses comics’ unique visual storytelling qualities to catapult the reader into the fourth dimension – a place where space and time operate on a nonlinear level. McGuire offers readers a unique vantage point from which to observe everyday life. Only the comics medium can offer a metaphysical perspective like this, imho. This book is not just for fans of the form, as someone on Twitter rightly pointed out, but for any (digital) storyteller. “Here” is available in English, French and Dutch. This is why I go to festivals: to discover new artists, new books and artistic movements I’ve never heard of. 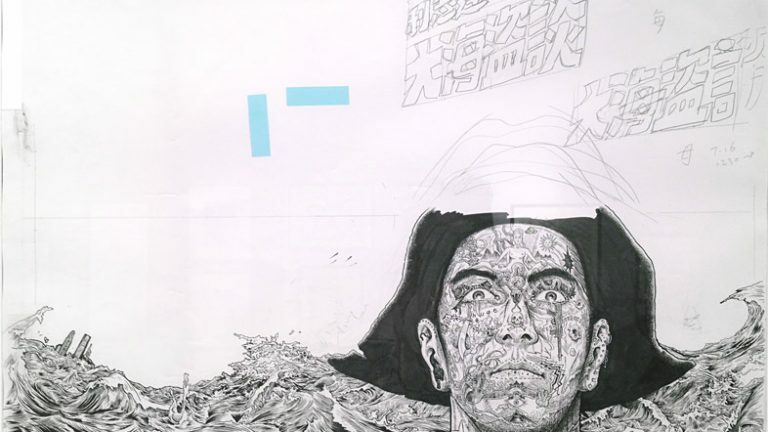 This year, Angouleme introduced the work of Hong Kong-based ‘manhua’ artist Li Chi-Tak to French audiences for the first time. Curated by the Hong Kong Arts Center, this was the first European expo of “the godfather of the Hong Kong indie comic scene,” although that description fails to do the artist justice. Chi-Tak is a wizard of sequential storytelling, who masters many genres and styles. His meticulous drawings and compositions are striking. I’ve never seen anyone break down an action scene the way Chi-Tak does. Unfortunately Li Chi-Tak’s older books are extremely hard, if not impossible to find outside of China. You might be able to track down a second hand French copy of The Spirit (1989) on eBay. A new title, The Beast, came out in French last month. Until Chi-Tak’s books become more widely available, Google images and Pinterest will have to do for now. Created by Michaël Sanlaville, Michael Balak and French comics star Bastien Vivès (A Taste of Chlorine), Lastman is a fast-paced action-adventure series inspired by the codes and the production methods of manga. I’ve been a big fan of Vivès’ dynamic art and his flowing lines, for some time now. And the art of Lastman is simply electric. The story follow the adventures of a young fighter, Adrian Velba, his mother, and his rugged combat partner and mentor. In France, where one third of all comics sold is a manga title, Lastman is a hit series. To give you an idea what this means: the print run of book 8 is 500,000 copies. Lastman won Best Series at Angouleme in 2015. Aimed at kids first and foremost, The Lastman: Universe expo reflected the ambition of its creators; to create a transmedia blockbuster series. 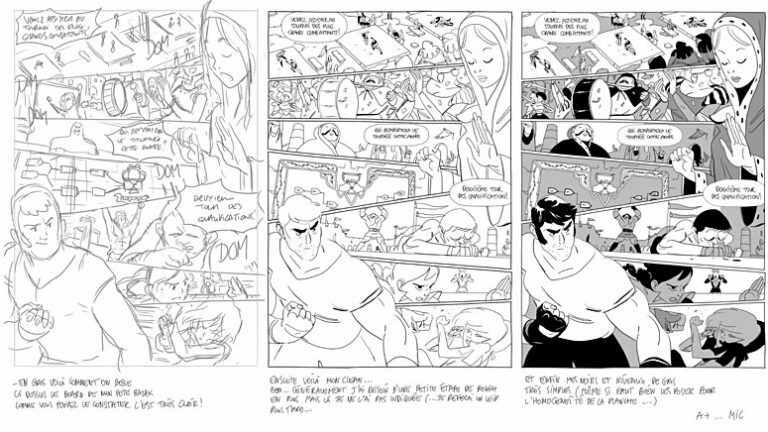 A working demo of the Lastman video game and a pilot of the animated TV series, to air on France4 later this year, were included in the show. Lastman is available in French and English. Lastman is on Tumblr. Unlike the Comic-con’s of this world, Angouleme has, until now, largely ignored motion comics and other new and emerging comic formats. Angoulême is all about print. The Lastman expo and Phallaina are exceptions. Phallaina is a horizontally scrolling graphic novel app for mobile platforms, written and directed by Marietta Ren, and produced by Small Bang in co-production with France télévisions Nouvelles écritures. 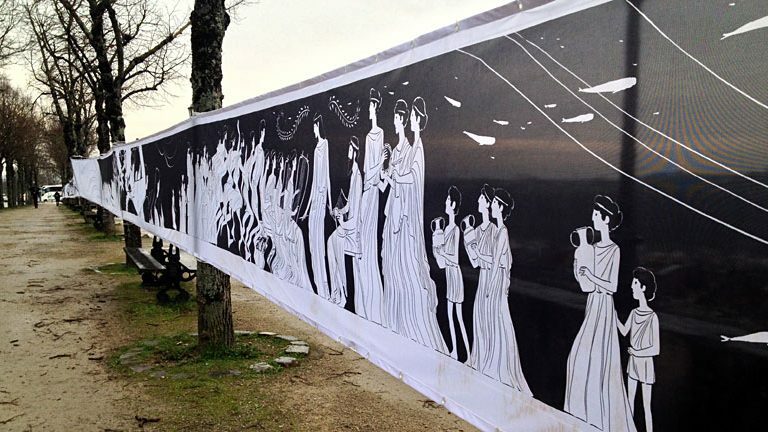 Angoulême showcased a monumental outdoor installation version of Phallaina, which consisted of a huge banner accompanied by a soundscape. The installation works as an eye catching piece to promote the app. The graphic novel app though, is simply wonderful. Phallaina is a story about a girl who suffers from a very rare form of epilepsy. Her reality transforms into a surreal world of experimental therapies mixed with ancient mermaid myth. Ren’s beautifully loose and flowing black and white drawings work really well for this specific storytelling format. The ambient soundscape (headphones are a must) is also worth mentioning. The Phallaina app is free and in English and French (App Store | Google Play). Each January, the Angoulême Comics Festival puts up huge tents in the town’s squares to house the largest comic book market in Europe. What never ceases to amaze me, especially on Saturdays and Sundays when the crowds far outnumber the professionals, are the long queues in front of “Le Nouveau Monde” (The New World). This is the largest tent, where some 75 or more indie and small press publishers present their wares. Men, women and children of all ages line up to find out what’s happening in the world of alternative comics. How cool is that? 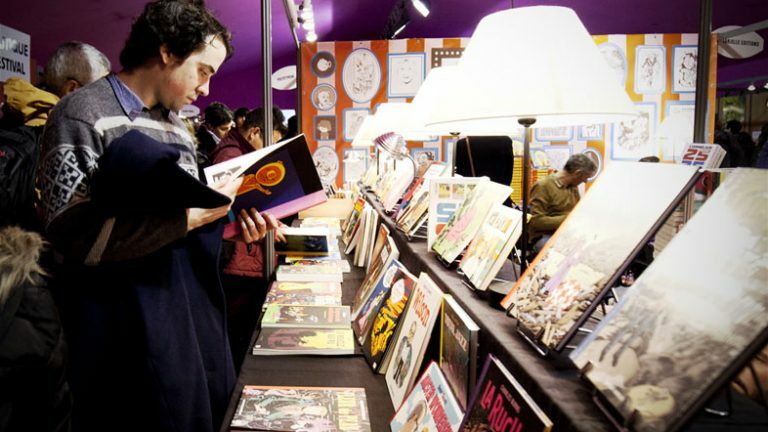 The sheer volume of indie publishers, artists and graphic novels you will discover at Le Nouveau Monde is overwhelming, and worth the trip to the festival. If I’d have to pick one thing not to miss at the FIBD, this is it. 2. 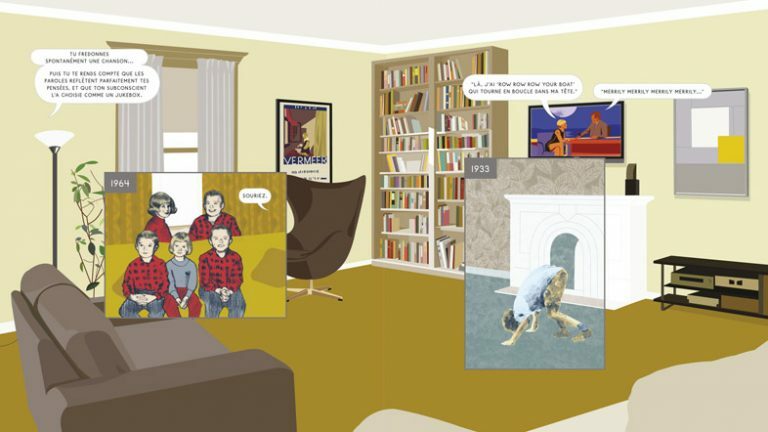 Award: Best Book - Richard McGuire's "Here"
The announcement of the nominees for the “Palmare Officiel,” Angoulême’s Award for the Best Book was overshadowed this year by an unfortunate scandal, as the selection committee failed to nominate any female authors. I won’t repeat the story here, as much has been said and written about it. Names were quickly added to the list, but the harm was already done. It’s a shame, because this year’s winner deserves the accolades more than anyone else on that shortlist. 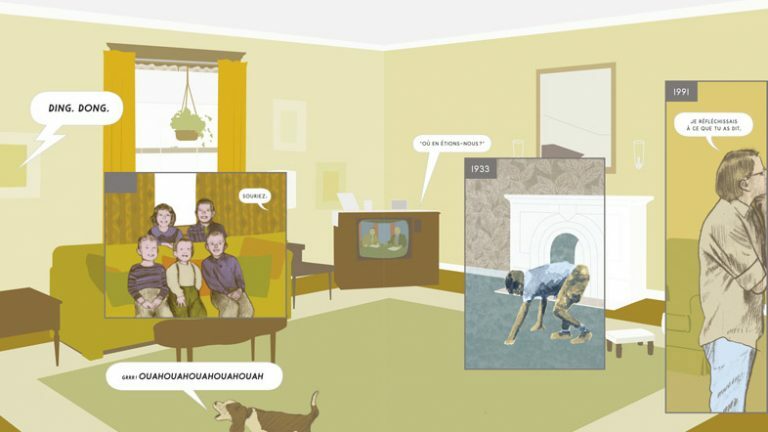 “Here” by Richard McGuire (US, 1957) is unlike anything you’ve seen or read before. It tells the story of a single room in a house throughout time. The POV is always the same. McGuire’s use of panels within panels to juxtapose fragments of the past, present, and future is revelatory. He uses comics’ unique visual storytelling qualities to catapult the reader into the fourth dimension – a place where space and time operate on a nonlinear level. McGuire offers readers a unique vantage point from which to observe everyday life – a metaphysical perspective that only the comics medium can offer. This book is a must read. And not just for fans of the form, as someone on Twitter rightly pointed out, but for any (digital) storyteller. “Here” is available in English, French and Dutch. Isn’t this what festivals are for? Discover new things, new artists or movements you’d never heard of before? 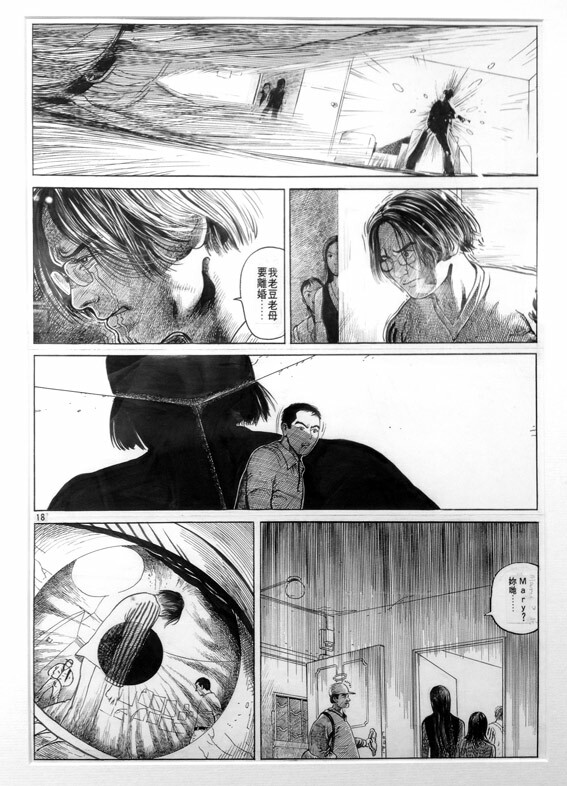 This year, Angouleme introduced the work of Hong Kong-based ‘manhua’ artist Li Chi-Tak to French audiences for the first time. Curated by the Hong Kong Arts Center, this was the first European expo of “the godfather of the Hong Kong indie comic scene,” although that description fails to do the artist justice. Chi-Tak is a wizard of sequential storytelling, who masters many genres and styles. His meticulous drawings and compositions are striking. I’ve never seen anyone break down an action scene the way Chi-Tak does. Unfortunately his older books are extremely hard, if not impossible to find outside of China. You might be able to track down a second hand French copy of The Spirit (1989) on eBay (I did). A new title, The Beast, came out in French last month. It looks great, but the color art doesn’t stand out in the way in the same way that his previous work in black and white does. Until his books become more widely available, Google images and Pinterest will have to do for now. I’m a big fan of Vivès’ dynamic art and his flowing lines, and Lastman is no exception. The art is simply electric, and somewhat reminiscent of Vivès’ Polina, although the story is not. The story follow the adventures of a young fighter, Adrian Velba, his mother, and his rugged combat partner and mentor. In france, where one third of all comics sold is a manga title, Lastman is a hit series. To give you an idea: the print run of Tome 8 is 500,000 copies. Lastman won Best Series at Angouleme in 2015. The Lastman: Universe expo, which was aimed at kids, reflected the ambition of its creators; to create a transmedia blockbuster series. A working demo of the Lastman video game and a pilot of the animated TV series, to air on France4 later this year, were included in the show. Lastman is available in French and English. Lastman is on Tumblr. Unlike the Comic-con’s of this world, Angouleme has, until now, largely ignored any new (digital) forms and formats of the comics medium. Angoulême is all about print. But the Lastman expo and Phallaina are clear indications that this might be about to change. Phallaina is a horizontally scrolling graphic novel app for mobile platforms, written and directed by Marietta Ren, and produced by Small Bang in co-production with France télévisions Nouvelles écritures. 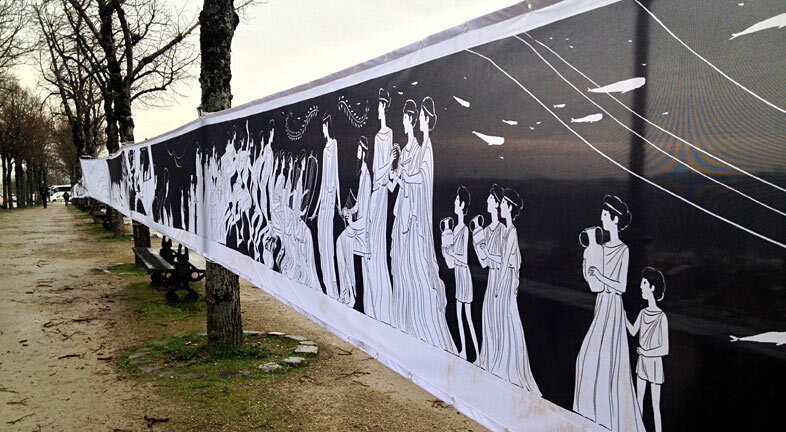 Angoulême showcased a monumental outdoor installation version of Phallaina, which consisted of a huge banner accompanied by a soundscape. The installation probably works as an eye catching promotional piece for the app, but doesn’t really add much. The graphic novel app though, is simply wonderful. Phallaina is a story about a girl who suffers from a very rare form of epilepsy. Her reality transforms into a surreal world of experimental therapies mixed with ancient mermaid myth. Ren’s beautifully loose and flowing black and white drawings work really well for this specific storytelling format. The ambient soundscape (headphones are a must) is also worth mentioning. Remco is the editor of Submarine Channel, and he occasionally produces animation and game projects, such as the interactive graphic novels The Art of Pho and Ascent from Akeron. He initiated and ran the popular website about film title design, 'Watch the Titles' for many years. And he recently launched Screendiver.com – an online directory where readers can discover the best interactive comics.